Today, an increasing number of companies are outsourcing parts of their recruitment functions to skilled experts. An outsourcing partner like Outsource2india can help search candidates from job boards and internal databases, post advertisements for open positions on job boards, and screen resumes. This can help the business focus on its core functions and reduce the time taken to recruit candidates. An offshore HR BPO like Outsurce2india can also research open positions in other companies on their web sites or job boards, which can help you analyze market trends. In addition, we can research passive candidates and perform skills testing. We can leverage our extensive experience of working with diverse customers to help you find candidates that not only have the right skill-sets, but also fit into your organization's culture. We can help you reach out to a larger number of people by researching passive candidates over the internet. These are professionals whose resumes may not be easily accessible or not posted on job boards. Our dedicated team uses advanced internet search techniques such as Boolean, Flipping, and Peel back to reach them. All you need to do is give us your requirements, and we will search for passive candidates on various search engines, directories, user groups, special interest groups, alumni pages, etc. When you leverage our services for human resources outsourcing, you get access to a partner that puts your needs first. Whether you want us to do job posting on the internet or screen candidates and arrange interviews, we can customize our solutions to fit your exact needs. We are committed to working as your partners. Contact us for recruiting process outsourcing services. 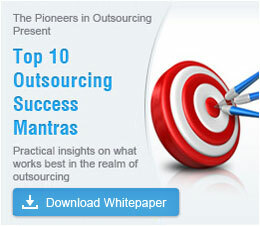 Expert opinions on how outsourcing will shape up this year. An overview of some of the results of outsourcing.